Monday 30th January 2017 is an important day for the Holiday Inn Stoke-on-Trent. This is because they hosted the GRAND OPENING of their amazing function suite named after the legendary footballer, Gordon Banks. Gordon Banks himself opened up the suite for the hotel and helped the guests and team to celebrate the launch of the suite in style! Accommodating up to a total of 150 guests, The Gordon Banks Suite is designed for conferences, weddings and any event within the local area! The new suite has undergone a full public areas refurbishment to introduce a more modern and open lobby concept which also encourages all day dining! This open style lobby is very modern and it embraces what Stoke-on-Trent has to offer in a warm and welcoming atmosphere providing a mix of art and photography throughout the lobby. 188 newly refurbished bedrooms and bathrooms accompany the Gordon Banks Suite along with a Spirit Health and a motorway location. The Holiday Inn Stoke-on-Trent have a lot to offer you if you stay here! 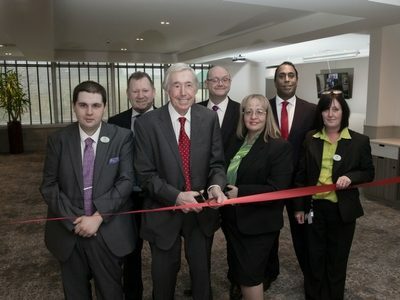 The picture above is Lawrence Davis’ own Business Development Manager, Amanda Nicely, with the legendary Gordon Banks. Amanda loved her visit to the grand opening of the Gordon Banks Suite. The Holiday Inn and Lawrence Davis have been working together for a number of years and we were very excited to find out that a refurbishment was on the cards. The difference in the before and after is amazing. The new look of the hotel is contemporary and very stylish, yet warm and welcoming. The Gordon Banks suite is the perfect place to hold a corporate event, party or wedding, as the high spec and impressive finish of the room sets the scene for any prestigious gathering. Well done to Mark, Liam and all the staff on this fantastic achievement. Why not check out the Gordon Banks Suite for yourself and take a visit to the Holiday Inn Stoke-on-Trent? Check out their website for information such as bookings, venues, events and more!